When I saw that this string was one continuous line, I thought, ahha, another celtic knot. However this one was quite tricky, especially in the bottom left where the angles are so acute. In the end I had to make the angles less acute so that I could get the unders and overs going the right way. It turned into a kind of Moebius Celtic Knot. Does the tangle in the background have a name? I got the idea from a couple of the Moebius Sydrome submissions. It looked easy but it wasn't. This challenge was posted by Laura Harms at Diva Challenge 104. The string for it can be found here. 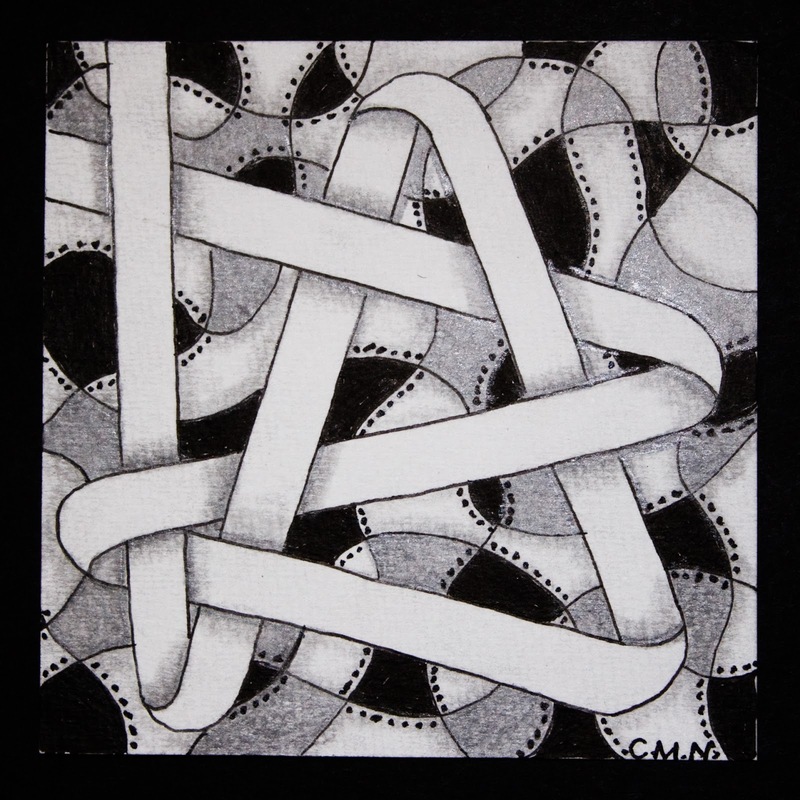 Do you think you might like a Zentangle puzzle? If so, view my post at Zentangle Puzzle 1. Update: The name of the background tangle is NEURON. Thanks Jana for the information. My favorite so far! I wish I had thought of something so perfect! Wow, I just want to pull the ends!!! This is amazing! I love the background, and the ribbon looks like it could be plucked off the page. Very creative. This is really great. I love the way you turned it into a ribbon celtic knot. And yes it reminds me of moebius too. The background is great. I don't know either if it has a name, but it is neat looking. Love this, great concept and your shading is perfect! Yes, it is neuron. I checked on tanglepatterns.com. Thanks. What a lovely interpretation of the string! Stunning !I was wondering what to draw but it will be hart to top this :). The ribbon is great. The shading and the Neuron background really set it off. I think 'stunning' is the one possible word for your tile. What a lovely! I like that you left the ribbon white. Beautiful tile. I like the ribbon, and I like the background. But the total is more than the sum of its parts. Ohhh, it looks like I could just pick up that ribbon. Beautifully done. I can see that it wasn't easy...but very successful!